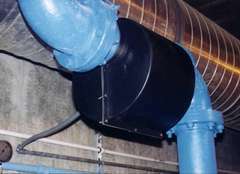 Problem: When an electronic descaling unit was installed in a large pipe (i.e., > 3 in diameter), the output power significantly dropped. Problem: Induction is zero at the center of pipe, where flow velocity is maximum. Problem: Manual wrapping at site is unsafe and impractical.